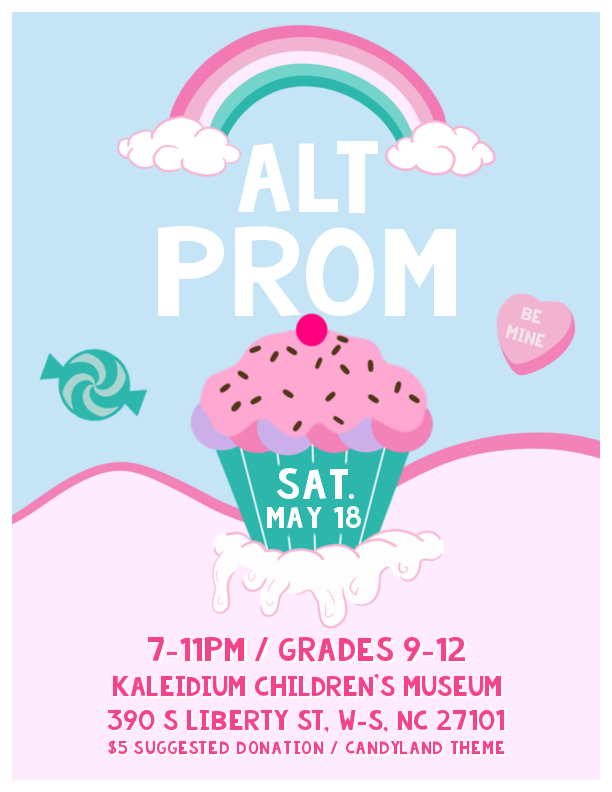 Winston-Salem’s 13th annual Alternative Prom will be held on May 18th, 2018, at Downtown Kaleideum, from 7pm to 11pm. Our theme this year is Candyland!! The event is open to any high school students in grades 9-12. Admission is free; a $5 suggested donation will help us make sure Alt Prom will continue to happen. Tickets are not required. Please note that for security reasons, once each young person has entered the event, they cannot re-enter a second time. Get ready for an amazing evening of music, dancing, queer community, games & entertainment! Alt Prom is hosted by North Star and planned by North Star’s high school Youth Leadership Council, with additional support from many community partners. We expect 200+ youth to attend this affirming and fabulous event. Please consider these ways you can help make this a wonderful night! Adult volunteer shifts will cover different times between 5:30pm and 11:30pm on May 18th. Shifts will each be 2 hours or less; folks can sign up for more than one shift. You must be 21+ to volunteer. There will be 3 or 4 different Alt Prom volunteer trainings held at North Star in the month before Prom. Each adult volunteer can sign up for whichever date worked for them, but all volunteers need to attend one of these trainings or make other arrangements with the Director. Sign up for your volunteer training and shifts! If you represent a business or organization who’d like to sponsor Alt Prom or contribute donations to help us make this event amazing, please contact Nyles at director@northstarlgbtcc.com. You can donate directly online at our GiveLively page. If you want to donate food or beverages on the day of Prom, please sign up here. Learn more about our Youth Programs, including socials, leadership opportunities, and support. Read about Alt Prom 2018.